RAY ARCHULETA, nationally-renowned soil scientist, will provide two educational workshops at the Tainter Creek Watershed Council events planned for July 25-26. POSTED July 3, 2018 12:52 p.m.
CRAWFORD AND VERNON COUNTIES - The Tainter Creek Watershed met on Monday, June 25 to discuss their upcoming event featuring Ray Archuleta, a nationally-known expert on soil health. The meeting was held at Woodhill Farms, the farm of council members Laura and Brian McCulloh, where the Archuleta events will take place. 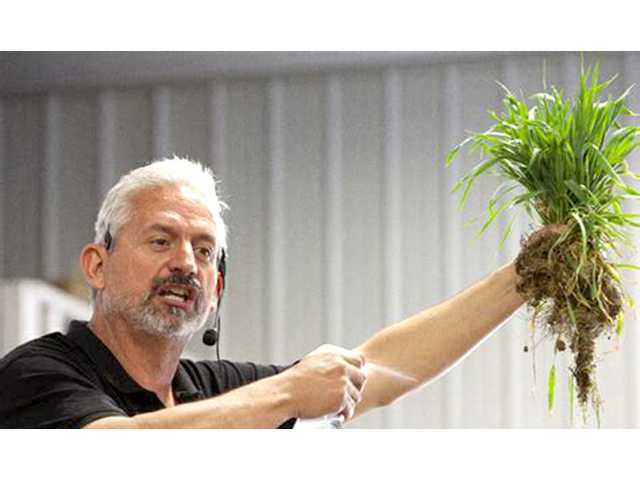 The ‘Soil Building and Healthy Farms’ events featuring nationally renowned soil health consultant and expert Ray Archuleta will offer participants inspiring presentations and engaging discussions will cover many themes focused on building and improving your farm’s soil. Featured topics include cutting costs, reducing flood impacts and farm inputs by using cover crops, managed grazing, and livestock. On-site soil pits, rainfall simulator, and the new roller-crimper will be on for a demonstration to help improve your bottom line. The first event will be held in the evening on Wednesday, July 25, from 6 to 9:30 p.m., and the second event is Thursday, July 26, from 10 a.m. to 4 p.m. You will get the most benefit from Ray Archuleta’s passion and experience by participating each day and you will come away with a deeper understanding of the living soil beneath your feet. Both events are located at Woodhill Farms, S7589 Tainter Hollow Road, Viroqua, WI 54665. Tickets are $25 for one event or $35 to attend both, and each include a meal. Reduced rate available for students. All proceeds will go toward improving the Tainter Creek Watershed. On Wednesday night, the meal will be catered by the Rockton Bar. Participants will be treated to barbecued chicken, meatballs, and all the fixings. Members of the Watershed Council will all contribute an item for the dessert. On Thursday a grilled brat lunch will be served. Grant and Jeff agreed to physically transport tables and chairs from the Franklin and Sterling Town Halls on Tuesday, at 1 p.m. If necessary, they may reach out to Utica Township as well, depending on how many register for the events. The group will meet later in the afternoon to make final preparations for the event. Crop consultants will earn CEU credits. Advanced registration is required and tickets are limited. Contact Sarah at 608-637-5480 or by visiting Land and Water Conservation Department 220 Airport Road, Viroqua, WI 54665 to reserve your spot. There will also be a FFA and 4-H Pancake Breakfast with Ray Archuleta held on the farm on Thursday, July 26, 7-9 a.m. for school age youth with a serious interest in agriculture and conservation. Pre-registration is required. The group gathered, including Berent Froiland, Grant Rudrud, Jeff Ostrem, Tim Erickson, Duke Welter of Coulee Region Trout Unlimited, Bruce Ristow, Matt Emslie of Valley Stewardship Network, Sarah McDowell and Ben Wojahn of the Vernon Land and Water Conservation Department, Laura and Brian McCulloh, Chuck and Karen Bolstad, Josh Engel, and Ryan Cornet from Senator Tammy Baldwin’s office, discussed the ‘Field and Streams’ event held at the beginning of June at Bruce Ristow’s farm. Ristow observed that after the event, held in one of his cattle pastures, was over, he and his wife Sue had gone out to look around and make sure that everything was cleaned up and ready for the cattle to be let back in. Grant Rudrud raised the question, given the great success of the event, whether the group should make it an annual event, moving it around to different locations on the creek. There was discussion of the plan for award of funds from the DATCP Producer-Led Watershed Grant the group had received for cover crop installation and well water testing. Berent Froiland recalled that the group had agreed to fund $27 per acre, for a total of 500 acres. • preference for multi-species planting and innovative approaches. Regarding the funds for well water testing from the grant, the fund will pay to test 18 wells, with the owner paying $50 and the grant funds paying $200. The group formed a subcommittee composed of Bruce Ristow, Chuck Bolstad and Ben Wojahn to discuss the best approach for the well water testing and make a recommendation to the group at their next meeting. There was some agreement that it would be most useful to the group’s goals to try for a fairly broad geographic dispersion of the tests in order to give the group the best possible picture of ground water quality in the watershed. One event participant suggested the group should consider working with The Center for Watershed Science and Education (CWSE), a joint project of UW-Stevens Point and UW-Extension Stevens Point. From an article in the January 11, 2018 issue of this paper, ‘Natural Capital – is it time to take inventory?,’ readers learned that CWSE offers three different testing packages at rates that are very cost effective. The three packages are the Homeowner, Metals and Diaminochlorotriazine or DACT tests. The county or township is responsible for organizing distribution of the testing bottles, which are supplied by CWSE. The ‘Homeowner’ is the basic package. This package includes the two most important tests to perform regularly on a rural well - bacteria and nitrate. They say you should consider the ‘DACT Screen​’ package if your well is within one-quarter-mile of agricultural fields where corn has been grown, or previous tests indicated elevated levels of nitrate likely caused by agricultural fertilizers. But the best part is what the landowner and community receive back from CWSE. Michenich pointed to a recent project in Chippewa County where very good results were obtained as a great example of how to conduct a groundwater inventory. In the county program, 500 wells in the county were all tested at the same time.